This EMOW Tank from Kanger is the newest clearomizer in their line and it is top notch. 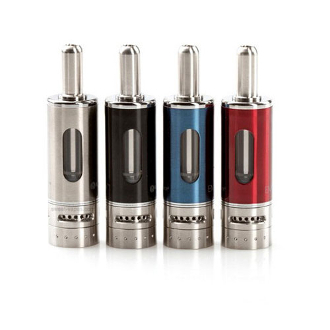 It is made of stainless steel and Pyrex glass, making it a sturdy clearomizer that looks streamlined and classy. It is a bottom feeding tank with replaceable duel coil heads. Both features make this tank simple to use and will make your vaping experience a great one. With this clearomizer, you are able to manage the amount of airflow you receive to customize your vaping experience. This is achieved by the airflow control valve. Simply turn the airflow control valve ring to the left or right to regulate the amount of air. Turn the tank upside down and unscrew the bottom base. Unscrew the burned out coil head from the base and replace with a new one. Fill with e-liquid and replace the base. Fill the tank with less than 1.8ml e-Liquid, careful to keep the liquid from entering the center tube. Do not overfill. Carefully replace the bottom and screw the tank onto the battery.